Hello, friends! I’m so excited today to share my interview with Jason VanHorn, an indie author who recently released his debut novel Alabaster Dangermond and the Serpent’s Blade through Goldenwood Press. For anyone who missed my last blog post, you can read all about Goldenwood Press, our new imprint, here. It probably won’t take long to figure out why Jason is one of my favorite authors–he’s also my husband. But, biases and conflicts of interest aside, there’s still plenty to learn from this author of clean, exciting MG spy fiction. You’re a college geography professor by day. When did you decide you wanted to write stories too? I started writing stories when I was a little fella and later in high school I started writing my first novel. It was a scifi adventure but it was really awful and no one else around me was writing, so I gave up pretty quick. The next spark of momentum came on a camping trip with friends when I was in grad school. As we sat around the camp fire, we talked about wanting to write stories and that’s when I started writing down some of my ideas in an idea journal my wife gave me. My work as a professor has given me opportunities to write academically and now I am working hard to find time in the evenings to write fiction. Oh yes! I love thinking about space, place, and scale. Reading books and journal articles in geography about interconnections of people and places inspires me. I want to bring my geographical knowledge into my fiction work as much as possible. One example is the interactive online maps I’ve built for readers of Alabaster, which appear on my website. Tell us a little more about Alabaster Dangermond and the Serpent’s Blade. What inspired the story? Alabaster is 14 and he’s working to become a secret agent in a clandestine CIA school. His story is a spy adventure. Ultimately the book is about friends, family, and the power of good over evil. My children inspired the characters and many of the missions as they asked me long ago to start telling them stories. I took those wonderful storytelling and creating interactions and wove my first MG novel. How did you decide to self-publish using your own imprint? What’s been the best part about going indie? Any regrets about not going traditional? Great question! It started with a writing coach friend who shared many positive aspects of indie publishing. After investigating it and seeing how I could go about indie publishing in a professional manner, I jumped right in. Although there are pros and cons to everything, I’ve liked going indie because it gives me control over different aspects of the production process, like hiring the cover designer, controlling the interior design, adding in all the elements of secret codes inside my book, building my alabasterdangermond.com website for kids, and most recently, working on film rights to my book. No regrets at all. I still like the traditional approach and will always remain open to going traditional, but for now the learning that comes with indie publishing has been an amazing education. What is your favorite part of the writing/ editing/ publishing process? There isn’t a part of writing I don’t love – at least not yet. But easily my favorite part of writing is having a middle grade reader say they like my book – I’m not sure that will ever get old. I can imagine that must be pretty fantastic! How about your own kids? You dedicated Alabaster to them–how have they reacted to the story and having a dad who’s an author? Oh, to them, I’m just Dad. So whatever I do, whether being a professor, an author, or whatever, I’m still just Dad to them. They love that I have written a book for them (they’ve heard a lot of Alabaster Dangermond adventures!) and are eager to read the next story, but at the end of the day, they just want to know I love them deeply and I am for them and never against them. I can say, though, writing and storytelling has become a culture in my household. Can you give us any hints about Al’s next adventure? Sure. The next adventure is “Alabaster Dangermond and Astrid’s Jewel.” Al will find out more details about his parents as he faces off against Dr. Zerick Moonshae. You can expect even more action and adventure and a few new characters, cool new spy gadgets, and it will be a little longer. Many events happen in the city of London, which is one of my favorite cities in the world. Ooh, sounds great! I love the Paris scenes in your current book, and am looking forward to London. It’s fantastic you can share your love of traveling and geography through your fiction. Where can readers find you online to learn more? You can find all things Al on my website I have built for my readers, https://alabasterdangermond.com/. You can read about what’s happening, sign up for exclusive content, submit spy gadget ideas to Mary-Anne, or access the secret areas from the clues in my books and see the interactive maps I’ve built for my story. Thanks for checking it out and thanks for all these great questions! Thank you, Jason, for taking the time to answer. Best of luck as you work on Alabaster’s next adventure! 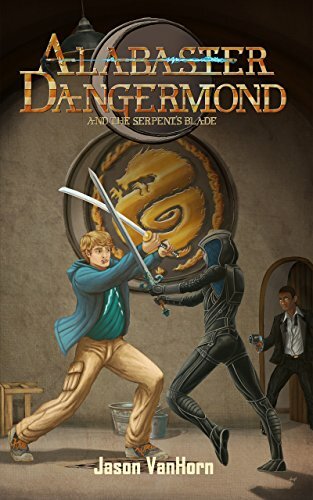 Thanks for joining us today, and if you’re looking for a fun middle grade spy adventure story, be sure to check out Alabaster Dangermond and the Serpent’s Blade on Amazon here. Images used by permission of Jason VanHorn. Header image from pixaby.com, CC0 license.